Bus: bus routes to Dumbarton Town Centre. Train: to Dumbarton Central then 5 minutes walk. Car: large free car park in front of the practice. 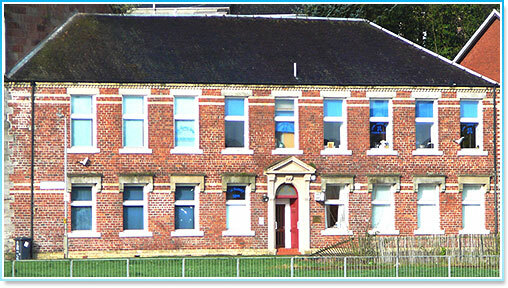 The practice is situated 2 minutes walk from Dumbarton town centre overlooking the River Leven. The dental practice has been a thriving business in its current location since 1992. It was formerly owned and managed by Bobby and Patricia Craig. Bobby retired in October 2006 and the practice was bought by Ghyll McCallum. Ghyll has worked hard to modernise the practice since then to accommodate the increase in patient numbers, incorporating a variety of improved and upgraded facilities for both patients and staff. Dentist, Hygienist and Staff numbers have also increased. There are currently five dentists and two hygienists working in the practice with an experienced support staff of 8 dental nurses and receptionists. Levengrove Dental Care is committed to providing high quality dental treatment to all of its patients. We happily accept new NHS patients and carry out private treatment on request. All the dentists are experienced in many aspects of dental treatment and we have an excellent support network of other dental specialists who offer orthodontic, implant and sedation treatment. Before settling in Dumbarton Ghyll worked in a variety of hospital and specialist centres after qualifying from Edinburgh Dental School in 1991 and achieving the Fellowship of the Royal College of Physicians and Surgeons of Glasgow in 1995. He enjoys all aspects of dentistry but has a special interest in cosmetics, dentures and anti-snoring appliances (the mandibular advancement splint). Ghyll has also been a post graduate trainer in General Dental Practice for several years. He volunteered as a dentist treating athletes at the Commonwealth Games in Glasgow 2014 and now works in the medical team covering dental trauma for the Glasgow Warriors Rugby team. Alison graduated from Glasgow Dental Hospital & School in 2004. She has gained vast experience working in General Dental Practice in the Glasgow area since then combining this with intense post graduate training. Since joining Levengrove Dental Care 10 years ago she has thrived and thoroughly enjoyed working in such a motivating and friendly practice. Out with work she is a devoted mum to her young family and loves nothing better than creating adventures with them whether in the kitchen, on days out or travelling abroad. Alison barely needs to sniff the Prosecco to get the party started on our work nights out! Rebecca Graduated from the University of Glasgow in 2014 with Honours. She enjoys all aspects of general dentistry and has also completed training in intravenous sedation and facial aesthetics. Outside of dentistry she has a keen interest in musical theatre and dance having performed since the age of 3 years old. She is also an avid skier and dabbles in the odd game of netball when time allows. Rebecca is delighted to feel part of the team at Levengrove Dental Care and thanks staff and patients for making her feel welcome. Patrick is a returning member of the dental team, having previously worked at the practice 4 years ago. He left in 2012 for the sunny shores of Australia where he experience a wide variety of working environments, from rural community dentist, oral surgery in hospital and work in private practice. Since returning to the UK, Patrick has been working in Glasgow city centre until finally returning back to Levengrove, and we're certainly happy to have him back! Patrick graduated from Glasgow Dental Hospital in 2010 and has since qualified in intravenous sedation. He has also developed a keen interest in restorative dentistry, orthodontics and oral surgery. Out with dentistry, Patrick is a enthusiastic sports fan, following Partick Thistle all over the country at weekends, and still enjoys travelling whenever possible. Grace graduated from Glasgow Dental Hospital in 2010. She went on to complete her MFDS qualification in 2012. Since then she worked in general practice and enjoys performing a variety of treatments. In 2016/17 become a post graduate trainer in general practice guiding newly qualified dentists into the profession. She completed the post graduate diploma in Conscious Sedation at the University of Newcastle to aid the management of anxious patients. Outside of work Grace enjoys travelling, eating out in new places and keeping fit at the gym and running. Michelle may be a familiar face to some having worked as dental nurse within the practice a number of years ago. Despite looking about 16 she is now fully qualified with a BSc in Oral Health Sciences from Dundee Dental Hospital & School in 2009 and has returned to work as the practice therapist. Her role within the practice is to carry out various treatments including scaling and polishing, adult restorations and all treatments for children. Michelle particularly enjoys, and thrives in the treatment of children and has a special interest in periodontology. In her spare time she goes to a variety of keep fit classes but she promises not to have her patients doing pilates and yoga! Hi! My name is Stacey and I am one of the dental therapists here at Levengrove Dental Care. I graduated in June 2016 with a BSc in Oral Health Science with distinction from Glasgow Caledonian University. I was also awarded Best Clinical Student at the University.My role within the practice includes carrying out hygiene treatments which are tailored to patients specific needs as well as restorative treatments for both adults and children. I have a particular interest in paediatric dentistry and also treatment of anxious patients (being an anxious patient myself!). In my spare time I enjoy running, cycling, up-cycling old furniture, Harry Potter and craft gin! ?